I went with the Maxxis Razr's this time cause I really liked the tire due to the tuff looking sidewalls. I had originally thought of going with the Cooper STT Pro tires, but wanted to see how well the Maxxis Razr's would fair. There were very few reviews out there on the interwebs, but the few reviews were pretty positive for the offroad use of these tires. 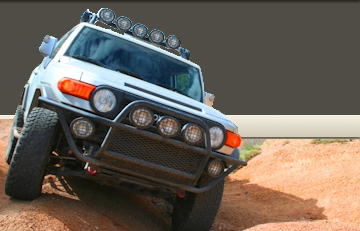 I will come here to the AZFJ site and give my initial thoughts and my long term use thoughts on the tires. The last opinion that put me over the edge on making this purchase was talking with Glider about how he liked the Maxxis tire brand. He really seemed to like how the Maxxis tires performed offroad. 2/25-Initial thoughts on the Maxxis Razr MT. They are quiet tires as of this writing. I am not really too surprised at the quiet street use of the tires. The rubber compound seems to be pretty soft compared to the Maxxis Bighorn I carry for the spare. Not much of a comparo since the Bighorn has been on there for quite some time now and is pretty weathered and sun beat. Off road use was phenomenal. Dropped these down to 14 psi to evaluate how well they would do at that psi range for rock climbing and overall comfort during this rocky trail. They hooked up nicely going through Florence Box Canyon trail. At the left side of the waterfall, which is the line most used by most off road vehicles that see the streets more than they see the trails, it climbed right up with out so much of a slip. I am pretty excited to see how well they hook up on more rocky trails out there. Since they are freshly installed tires, I did expect them to be very sticky on the rocks and they did not disappoint! During the rest of the hill climb section on the back half of this trail, I never noticed any slipping during the steeper inclines and declines of the trail. There isn't anything very steep, but still, I noticed no slippage. The after trail results....So after rocky trail usage, I usually am not happy to find a small chunk or two missing from my tires. This is kinda par for the course while out on Arizona's rocky terrain, so I was expecting to see a little trail damage, but knew I would not be disappointed when I found it. To my surprise, the tires had wear marks, but not one little ounce of rubber pulled away from the greedy rocks of our Arizona trails. I could see where the tires flattened out and the sidewalls made pretty good contact with whatever bit of trail that they could grab to make their way through whatever we were encountering at the time. In fact, they had more side wall marks than I had initially figured, but were in no way damaged at all. I am happy with every aspect of performance thus far and am looking forward to more trials and trails with these tires on the FJ. They did great and I expect even better from them to come for their next year of usage.